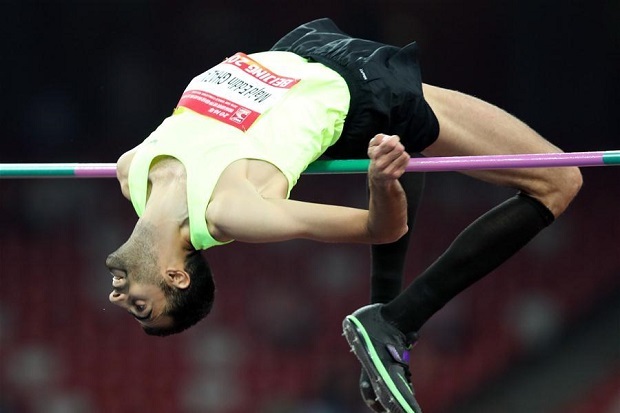 Majd Eddin Ghazal cleared 2.36 meters in Beijing. It’s an Olympic year, which means the biggest stars of track and field are performing under a brighter spotlight than at any other time. This is when established stars solidify their legacies, and also when new stars are born. One athlete taking advantage of the increased attention is Syrian high jumper Majd Eddin Ghazal, who recently put himself on the list of Olympic medal contenders by turning in 2016’s best jump in the world. At the IAAF World Challenge meet in Beijing on May 18, Ghazal cleared 2.36 meters (just shy of 7 feet, 9 inches) to top his previous personal best of 2.31 meters and post a mark better than any other high jumper in the world this year. Ghazal, a 29-year-old practicing Muslim, now joins the conversation along with Erik Kynard (USA), Bohdan Bondarenko (Ukraine), Zhang Guowei (China) and fellow Muslim Mutaz Essa Barshim (Qatar) as jumpers to watch when the Olympics kicks off in Rio de Janeiro, Brazil, on August 5.